CM: Text based! I spent way too many late nights/early mornings in the computer labs at school playing Adventure on Unix machines when I should have been doing Other Things. I don’t remember what Warren was working on when I first got to Atari, 2600 Adventure came later. Someone was working on a cool maze game that never went anywhere (that happened a lot). That may have been Warren, but, now that I’m thinking about it, it was probably Rick Mauer. I did Dodge ’Em first. I think it was listed as something like car crash maze game, the name came later from marketing. Trivia bit: Jim Heuther was the model for the box artwork, I think Heuther was working on Football and I think Stewart was doing Baseball. But there were a bunch of car games at that time, too. Fulop was doing Night Driver when I got there and Koble had just finished something Rally, Rally something, ugh, too long ago. Coin-op had just finished Asteroids. I spent way too much time downstairs in coin-op playing Asteroids, and then Missile Command, and then Battlezone, and then Centipede. After Dodge ’Em, I went straight to Warlords which was on the list as Kings in the Corner break-out game. I would like to set the record straight here—I did the 2600 game before the coin-op game even existed! I think that was the first time a coin-op game derived from the console game. Then I started Battlezone. But there were some weird things going on, my office was in a trailer in the parking lot, and I left to go somewhere else. However, Atari contacted me about turning Dodge ’Em into a marketing tool for Mercedes garbage trucks. They had given it to someone still there to do, but they couldn’t figure out the code (I had discovered a way to cheat a cycle out of the machine which later drove Mike Albaugh nuts when he was assigned to convert all the existing games to a new processor). I think Mimi Doggett had already done the truck graphics. Anyway, I did it in my spare time for free (!!!) while I was still at the other place—it took a very short time—and while I was doing it, Atari essentially talked me into coming back and I did Star Raiders as the first thing. They had figured out how to do bank-switching to get 8K of memory. I think Star Raiders may have been the first to make use of it. So I was back after 3 months and everything had changed—people had left to start Imagic, new management, new buildings, new game machine, bonuses. They made me a game group leader, which meant I did game design (read: now I got to put things on the list) and traveled a lot. I even got to meet the muppets! WN: The muppets? Like, Kermit and Miss Piggy? CM: Atari at that point was into franchises big time: Raiders, ET, Star Wars. BUT, any game idea had to be approved by the owner of the franchise—so George Lucas came by one day. Game design meant brainstorming sessions with franchise owners about how characters/story lines fit into what we could make the games do. It also meant Atari was spending incredible amounts of fast money convincing franchise owners that games were the fastest growing entertainment segment and they were foolish not to hop on board. The new management had decided that kids’ games were going to be big money and started hiring more women to do the games. I, being of the female persuasion, was made the group leader. So I traveled to New York to meet with Kermit and Miss Piggy (really I met with Jim Henson and Chris Cerf) for brainstorming sessions and dinner at 21. I also met with the [Atari] creative brains from Grass Valley somewhere outside of Philly to investigate a new theme park, to see how we could stamp the Atari mark on rides and entertainment. Atari was owned by Warner Bros. so there were several attempts to try to turn various popular movies/characters into games. I remember several long weekends at fancy resorts devoted to such brainstorming. I would come back with long lists of game ideas. Marketing and management would decide which ones they liked and would hand them off to developers. I have to admit, though, while I enjoyed the creative aspects of the job, I still wanted to create games that were strategically challenging for adults, as well as technically challenging for me. And I always had at the back of my mind that I wanted to do that computer animation thing. So, while I was supposed to be doing Other Things (I spend most of my life avoiding Other Things—like now I should be writing an essay on standardized contracts in international law), I started working on Tempest, mainly because people said it couldn’t be done on the 2600. You have to understand that this was a very different model for Atari game designers. Previously, we would noodle around with an idea, get some bare minimum thing up in the lab that could be moved about and people would come by and play it—and give feedback. We were a very close knit group. Games changed a lot over time or were abandoned. Eventually we would tell marketing we were done and they would set up a series of focus groups in Sunnyvale with 12- to 20-year-olds who would give more feedback. Only if that passed, would a game be released. Now, marketing was in from the beginning saying which games would be developed. The old-timers were very disgruntled and more people left. Eventually, I too left to go join a start-up doing high-end computer graphics run by Martin Newell (of teapot fame) from the University of Utah, which was one of the places I had contacted 6 or so years before about my animation idea. This became a theme. I eventually ended up at Sun Microsystems doing high-end computer graphics firmware because of Louis Knapp, another person I had contacted way back when, who still remembered me. The Sun computers with firmware I had written were used by the various new animation companies that were starting up. The ironic thing was that I was denied a job at PDI—who was finally doing what I had envisioned only 10 years later—because they felt I had been tainted by my game experience. The new generation of computer animation companies only wanted academics who had published at Siggraph. 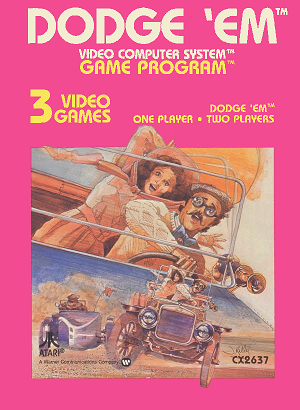 WN: So is there an actual "Mercedes garbage truck" version of Dodge ’Em out there someplace? CM: Yes. I have no idea how that came about and heard nothing more about it once I was done. Although... actually, I can guess, now that I think about it. Two things: Atari always bought in bulk to get that cost break—this was often a disaster and they were left with warehouses full of unused stuff. However, outwardly, Atari wanted to show how much money they were making. One way they did this was, every executive got a brand new Mercedes. When Atari crashed, they found a warehouse of unused Mercedes. I bet someone got a fleet discount and in return they got a Mercedes Dodge ’Em game. To give you an idea, I’ve been watching the third season of Mad Men on DVD—even though that was supposed to be 20 years earlier, it so reminds me of Atari. There’s a scene with a John Deere tractor that could have taken place at Atari. Copyright © 2011 Will Nicholes.